Samantha Howard and her brother Jackson from Medfield, recently had a lemonade stand at the Wheelock School soccer field to benefit the Medfield Animal Shelter. The kids sold 52 cups of lemonade! 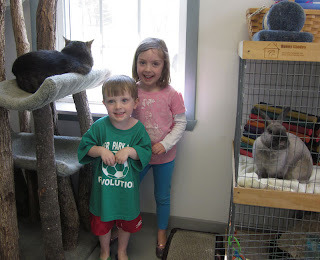 They came by the shelter recently with a donation $52, which will help buy lots of food for the dogs, cats and bunnies! They had a shelter tour, and are pictured standing between longtime shelter resident Missy the cat and new addition Chubby the bunny. Samantha is five years old and Jackson is three.